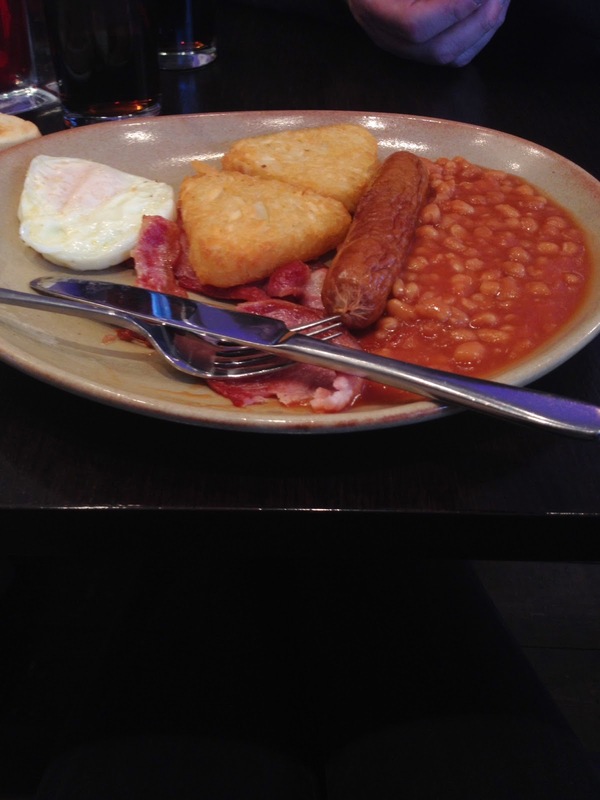 Post-clinic fry up, which is becoming a bit of a thing now...not complaining one bit! 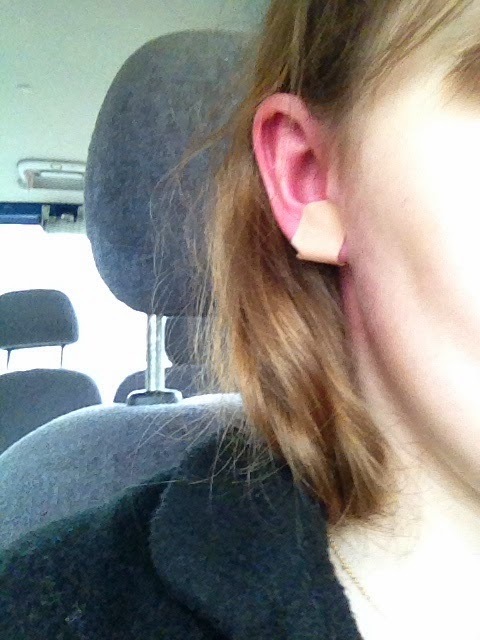 My ear after my blood test! Hi! So yesterday I went to the CF clinic, I finished IVs at the weekend but I have to start another course of them this Thursday. My blood test results showed that my infection levels are down but for some reason I'm still really breathless. My oxygen levels are 93% which is good (although they could be better!) and I had a blood test in my ear to test how much oxygen I was getting and that was fine too (they take it from your ear because they want to test the blood from an artery in your neck and the ear is the closest place.) But my lung function was crappy, it was just 93% when usually I'm like the mid-40's. I'm not really sure if that was accurate though, I'm really bunged up with hay fever so I think my blowing technique was off (lolz.) I got some new physio techniques and I'm going to change around some of my nebulisers so that alongside my IVs should shake off this chest infection once and for all...well I hope so, I've had it over a month! I'm glad that this time I can just do home IVs so no hospital stays for me thank goodness! So I'm doing more than double the amount of treatment every day that I usually do so as you can imagine I have hardly any time for anything else. I'm completely exhausted, I feel all floppy like a rag doll haha. I don't mind doing all the medicine and feeling tired, I have to do it so there's no use in feeling annoyed but when I'm stuck inside for a long time revolving almost my whole life around CF it makes me feel very anxious and nervous and a bit afraid but of what, I'm not too sure. Not my health, I never worry about that...I think it's more like worrying about the future and working and things like that. Pointless really but I can't help it. I'm worried I won't be able to be a 'grown up' if I'm just stuck indoors ill most of the time if you get what I mean? Like my life won't progress. I'll get over it soon enough, it's just at the moment I have a lot of time to just sit and think which I think is driving me a bit crazy. I just see other people my age doing all these things and I want to be doing them too so it's just frustrating. I can't wait to go back to work and have a bit of normality back! I'm feeling a bit cut off from everything, it's been this way all my life (like throughout school etc) because of being stuck indoors sick but it's not something you get used to...you still feel sad and left out of things. But the one thing stopping me from going cray cray are my family...they're so good to me, they're the best in the world! Glad to read you can do home IVs again, Josie, and that you have such a great support system....(((hugs)))) Thanks for keeping us updated. Ah Josie, I hope you feel better soon, put your feet up with plenty of glossy magazines. You have so many people that want to help you and be there for you, so you are never alone! Ah, I know so much how you feel about nervousness, especially being scared for the future. I had a big panic and cry to my mum just last week over it ("I don't wanna be sick!!!!" - the words I uttered between sobs). I was talking to my doctor about the anxiety and sadness I've been feeling over it, and the thing is I'm not really that upset that I'm ill - it is what it is, right? - I can cope with that for now, but it is scary to think of the future and how life might always be that little bit more difficult for me than it is for others. We do live in a pretty ableist society - some of my family still judged me for not having a job last year even though I was really sick! It was like they erased my illness and somehow found it easier to view me as lazy or avoidant, but I guess my illness being undiagnosed and a continual medical mystery it makes it really hard to make clear to people what is wrong with me and why I can't function properly all the time. It's good to have family that helps you. I hope you get better soon, wishing you plenty of rest this week. Ah Josie! I really hope your lung function improves STAT. You're such a trooper. Thank Pattz for Freddy dog and your familia. P.S I'm glad you liked my outfit from the other day, you totally inspired that look! Oh Josie, I really do feel for you! I wish I could just take it all away from you. You are so brave and I admire you so much for that - I hope that fry up was a little pick me up for you. Don't worry about becoming 'stuck' here with your life. Life is always ongoing and even if you feel like you've made no progress with life, you'll look back and see that those small things were actually something much bigger (cliche but true!). ahh those english shortcuts. I didn't get what those ,,CF mean'' so I went on google. It didn't explain me a lot, so I changed the language on Polish, and finally I got it. Josie, your awesome, very brave and strong women! :) I believe live will bless you in soooo many other things! :) Don't stop dreaming and don't feel down. You are amazing!